What is an Enterprise quality disk drive? It is not a desk-top computer disk drive. There is a lot of information on the label on the lid. It is a Seagate Barracuda ES disk drive. 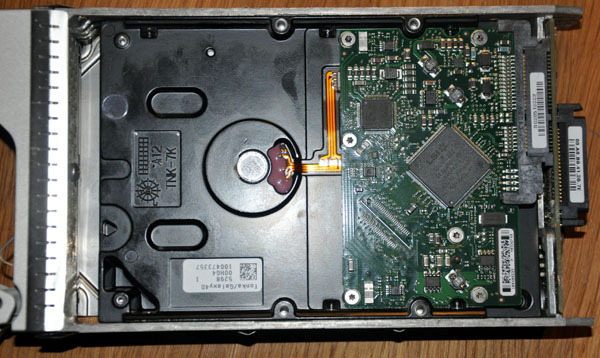 as a SATA 750GB 7200 RPM disk drive. either side of the copper voice coil are very strong. The gap between the magnets and the voice coil is less than one millimeter. 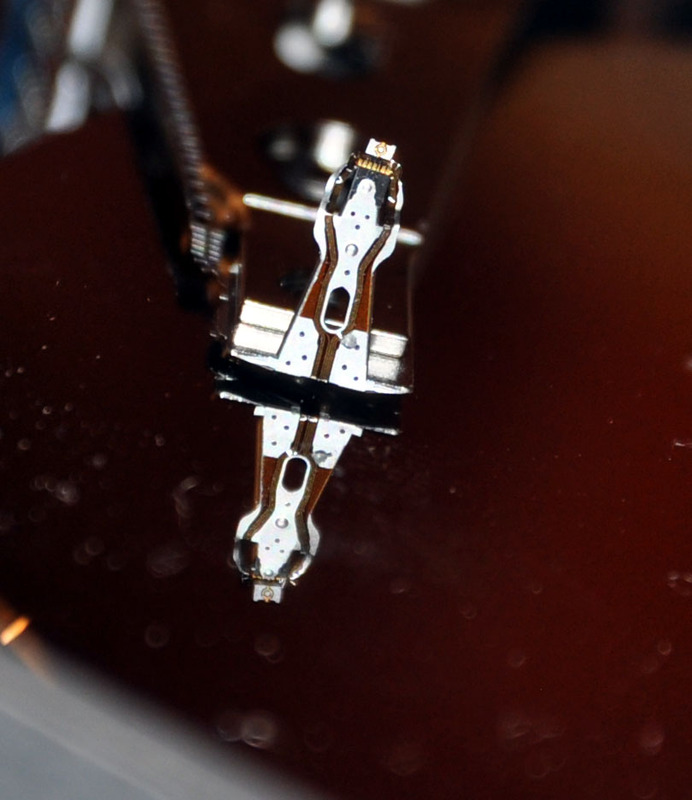 Close-up of the voice coil. There are five arms, one head on the top and bottom arms and two on the other three. The top head is broken. Bending it further up and closeup shows how complicated it is. 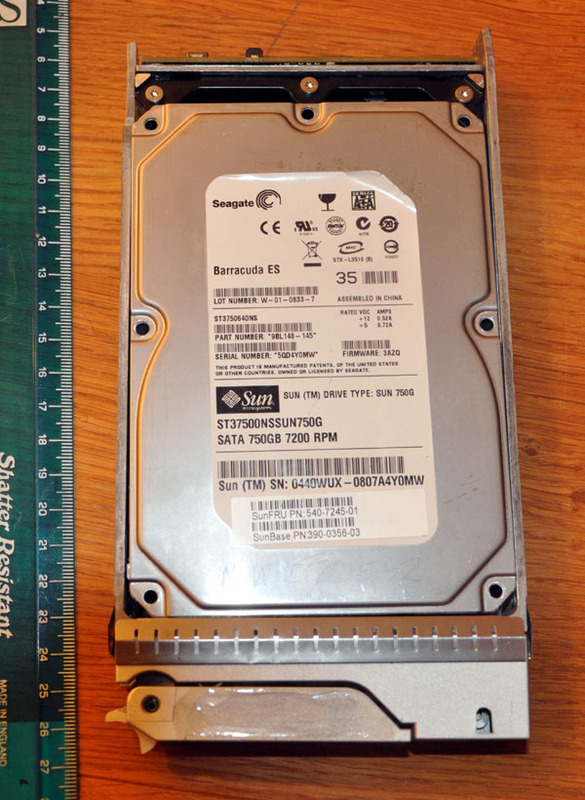 Seagate uses AcuTrac Technology on these drives. This means two actuators per head. near to the head, to keep the head closer to the centre of the track. The track width is 75 nanometers wide. That is 0.075 microns, a human hair is typically 100 microns. The other is the bit density written on the track which is 926,000bpi (Bits Per Inch). the bit density is 36,457 bits per millimeter, making 488 million bits per square millimeter. The underside of the drive. 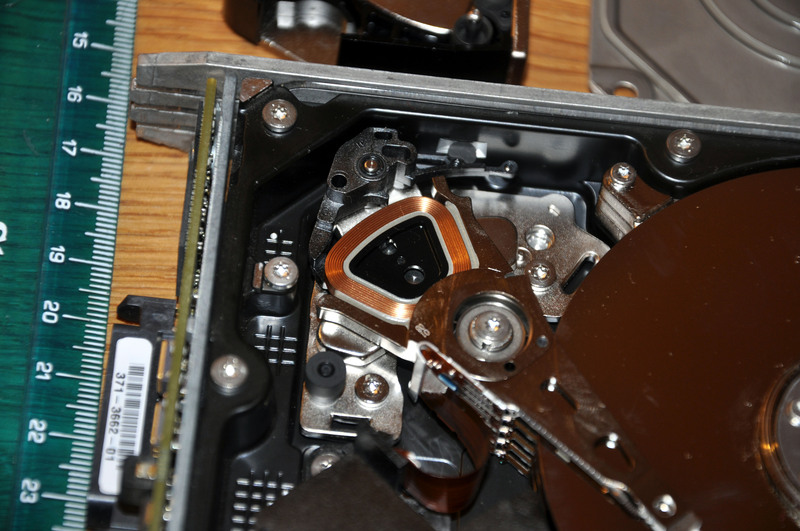 The most prominent feature is the three copper conductors to the disk motor. rotation speed, which is critical for accurately writing and reading the bits. 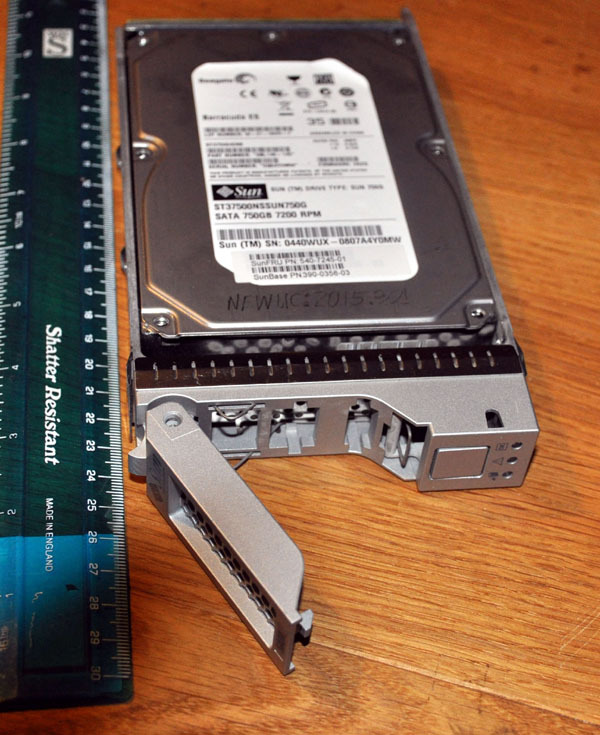 The large 176 edge-connector chip (4x44) is a Seagate hard drive controller chip. Pressing the square button on the right releases a handle which allows the disk to be unplugged. This is the rear of the drive. At the lower middle is a 40pin (2 x 20pin) plug that connects to a socket. This drive is "Hot swappable". Read on for an explanation of its use in a server cabinet. This is the front of the cabinet. In this installation there are six rows of 16 disk drives, totalling 96 drives. 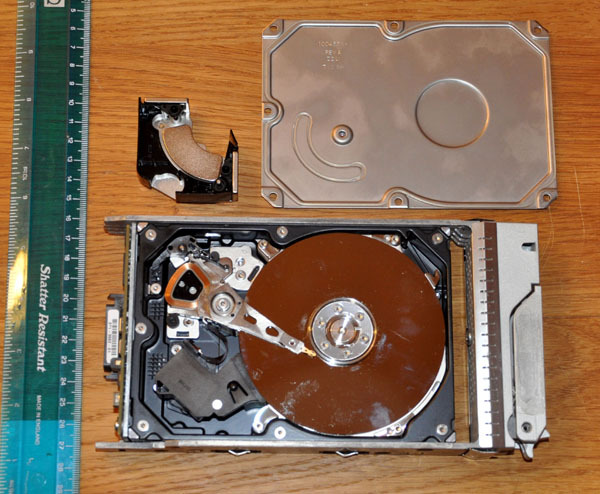 If they were 750GByte drives that is 72TBytes. At the bottom of the cabinet is a Sun Microsystems server. This is the rear of the cabinet. server to millions, or a server for an online bank. Whatever it is, it is crucial that it does not fail. So every operation at one is replicated at the other in case one installation is destroyed. 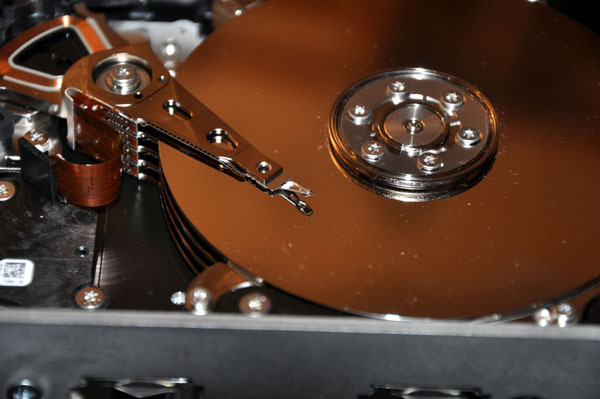 (Reduntant Array of Inexpensive Disks.) installation. the block into N chunks, and writes the chunks to N disks. chunk can be created from the (N-1) chunks plus the parity chunks. This is done on the fly by the RAID controller. goes to the computer room, unplugs the failed drive, and inserts a new drive. Note the three indicators. On the right, labelled OK, is green. failed disk that they do not remove the wrong disk!